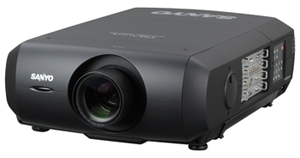 The Sanyo PLC-XF47 Projector is a bright LCD unit and has been an AV industry workhorse for many years as it is bright, relatively compact and robust, and can be fitted with a wide range of lenses. Request a quote to rent this hardware. WORLDS FIRST 15,000 LUMENS LCD PROJECTOR! Utilizing four high-output 300-watt UHP lamps as its light source, the PLC-XF46N delivers an amazing 12,000 ANSI lumens of brightness. Stacking two projectors in the twin-stack configuration can achieve up to 24,000 ANSI lumens of brightness. PLC-XF47 contains a new liquid crystal panel with high contrast optical system that achieves a contrast ratio as large as 2000:1, exhibiting natural and smooth gradation. By optimizing the dynamic range of luminance signals and reflecting the gamma settings and offsets, the PLC-XF46N displays the most genuine contrast and sharpness of images according their characteristics. Remarkable depth and outstanding picture quality are results of auto picture control. Images so crisp and smooth that are only made possible by a seamless edge enhancement technique. Enhancing image outlines while minimizing granular noise emphasis, the PLCXF46N generates sharp and realistic images. An optional PJ-Net Organizer network board allows for simple control and management of projectors via a CAT5 network connection. The administrator can use a network management software called PJ Master (optional accessory), and be able to centrally control all PJ-Net Organizer-mounted projectors within the network. A newly developed liquid crystal panel with an optical compensator that creates linear polarization, together with improved optical block cooling system, gives the PLC-XF46N the capability of being operated on a 24/7* basis. * In order to maintain a stable lamp condition, at least one hour of rest for the projector is required in each 24-hour period. * For appropriate care and use of the projector, regular cleaning of air filters is necessary. Cleaning is recommended once a week. However, the frequency on which cleaning is required depends upon the installation or operation environments. Top of the range Sanyo XGA data & video projector with 15,000 lumens and 2000:1 contrast ratio suitable for the largest jobs with audiences numbering in the thousands, or guerilla campaigns with giant images on streets and landmark buildings. Images can be huge and this projector is very, very bright. There are a huge variety of interchangeable lenses which are priced separately, call for details. We are happy to hire, demonstrate or sell these units. Please call or email for current purchase prices. Our hire rates are shown above, or see here for more options.